To culture functional soft tissues and organs in three-dimensional scaffolds, it is essential to elucidate the optimal scaffold mechanical properties. However, mechanoregulated soft tissue remodeling is not well understood. In this study, we hypothesized that individual cells are capable of remodeling extracellular matrix within a short proximity of themselves in order to match the stiffness of the broader surrounding matrix. This theory was implemented in a three-dimensional finite element model to simulate soft tissue remodeling of human fibroblast cells in two collagen–chitosan scaffolds with different mechanical properties. Simulation results closely matched with previously reported experimental data, showing that soft tissue growth in compliant (Scaf-A, 4.30 kPa) and stiff (Scaf-B, 17.03 kPa) scaffolds led to an almost eightfold difference in the resulting stiffnesses after 10 days (8.40 kPa for Scaf-A, 59.25 kPa for Scaf-B). Furthermore, varying the simulated rate for tissue remodeling by \(\pm \)50 % caused unequal changes in the resulting stiffness (+3.6 and \(-\)23 % for Scaf-A, +5 and \(-\)17 % for Scaf-B), and \(\pm \)50 % changes in the assumed upper limit on tissue stiffness only had larger effects on the stiff scaffold (+42 and \(-\)44 % for Scaf-B). 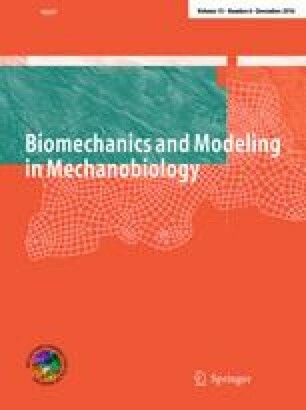 These results reinforce the notion that soft tissue remodeling is governed by the stiffness of the surrounding matrix, until meeting an upper limit on tissue stiffness. The online version of this article (doi: 10.1007/s10237-016-0791-4) contains supplementary material, which is available to authorized users. This research was funded, in part, by the Interdisciplinary Collaboration Grants (ICG) program at Binghamton University through the Health Sciences Transdisciplinary Area of Excellence (TAE).